Why should you lift weights? Weightlifting is all about setting goals and exceeding your personal boundaries on a weekly basis. To become stronger, more balanced, healthy, full of life and more energetic. To bolster your self esteem and add charisma to your every day appearance. The above are all ‘side effects’ of regular exercise, working out, healthy eating habits and proper sleep and relaxation. Do you want this ‘improved quality of life’ also? I’m convinced that your success in other sports and your daily life will find a solid base in weight training! I would like to say a special thank every author that has contributed in the early stages of the development of this exercises and workout related site. With their help this site has become a huge ‘starting point’ for many eager-to-learn fitness and drug free bodybuilding enthousiastics. I wish you all the luck and personal success reaching and surpassing your live goals through weight training! All the information presented on the BuildingYourBody© website and in the WorkoutManager™ software you are able to download is for educational and resource purposes only. It is there to help you make informed decisions about fitness training for sport. It is NOT a substitute for or an addition to any advice given to you by your physician. Before adhering to any BuildingYourBody information or recommendations you should consult your physician. Please understand that you are solely responsible for the way information on the BuildingYourBody website and software is perceived and utilized and you do so at your own risk. In no way will BuildingYourBody or any persons associated with BuildingYourBody be held responsible for any injuries or problems that may occur due to the use of this website, CDRom The Basics vol. 1, The WorkoutManager™ software or the advice contained within. BuildingYourBody will not be held responsible for the conduct of any companies and websites recommended within this site. This site contains sound information about exercises, workouts and weight lifting. It can be used for fitness, bodybuilding, powerlifting and home fitness purposes. Disclaimer: Buildingyourbody.com is all about general bodybuilding and weight training information. This is not medical advice and should not be implemented as such. You must not use the information on BuildingYourBody.com as an alternative to medical advice from your doctor or another professional health care provider. 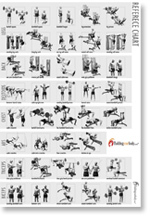 Yes, I want to download my FREE copy of the Exercise Reference Chart with over 38 Easy-to-Print fitness exercises and start right now! Yes, I want to receive more exercises and workouts by email on a monthly basis!